I'm using JeeNodes for a project to notify me when the mail has arrived. You know, like packages containing electronics goodies. With basic communications working in the lab, it's time to prepare the mailbox JeeNode to run off a battery. I bought a AA Power Board from Modern Device and installed it. The Power Board powers a JeeNode at 3.3V by boosting a single AA battery voltage using an LTC3523 boost regulator. 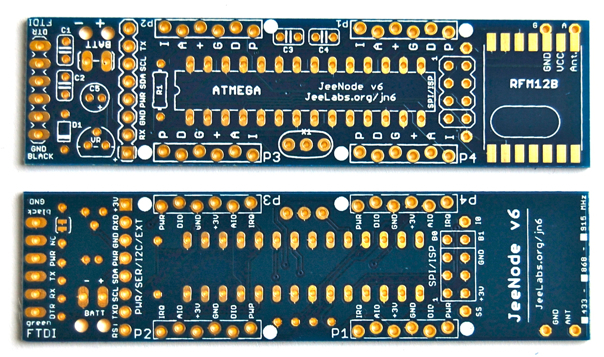 The design is very clever, offering many ways to connect the power board to your existing JeeNode. I chose to put it on the bottom side. Here's how. First, break off 8 pins of the included, extra-long breakaway header and install into the JeeNode so the short side with the plastic is on the top and the long side goes through the board.. This will be the main connection and physical support for the AA board. Next, break off one pin and install it in the SS pad, again with the plastic and short end of the header on the top and the long side going through the board. Do the same for the I0 pad. These two pads are outboard of the SPI header pads which are located between P1 and P4 right next to the RFM12B module. Now, solder on the battery holders on your AA Power Board. You can put them in a position to use a AA, AAA, or CR2. Finally, slide the power board on over the long side pin headers making sure the bottom side battery holders don't contact anything, then solder into place. The power board is now supported by 8 pins at one end and two at the other. Nice and sturdy. Configure the Power Board to output 3.3V by soldering the +3V solder jumper. Another solder jumper labeled BCHK permits the battery positive voltage to be routed to Arduino analog pins A4 or A5 (note that one cannot do this and also use I2C). In code, use analogRead() to determine if the battery voltage is dipping too low. After connecting everything and installing a AA, I connected the other JeeNode to my PC and lo and behold, the battery powered JeeNode was transmitting properly. It feels good to make some progress again. The next step is to refine the code on both nodes. I'll tell you about the completed physical sensor at a later date. 2013 Sparkfun AVC location announced!